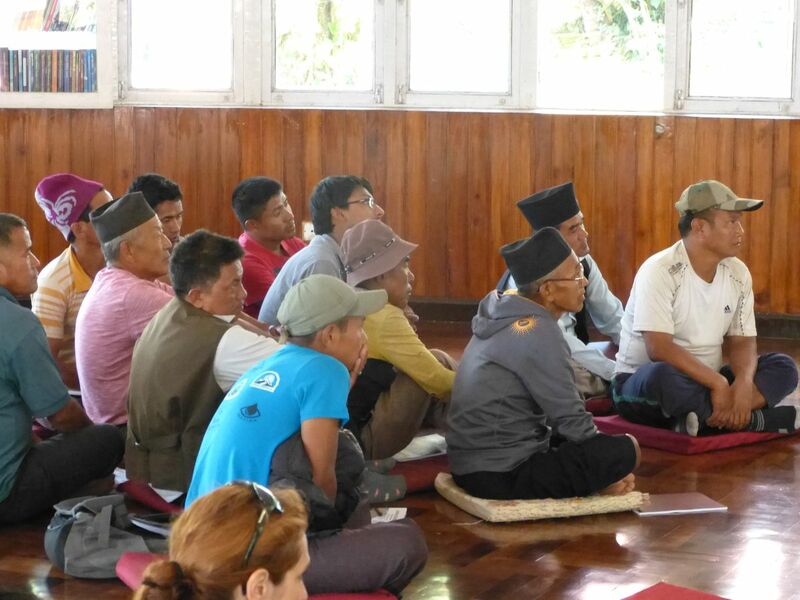 Colorado Nepal Alliance sponsored ten local builders to attend two separate earthbag building training events in Kathmandu and Sindhupalchowk District in early October. The builders were all from the highly affected districts of Dhading and Nuwakot. 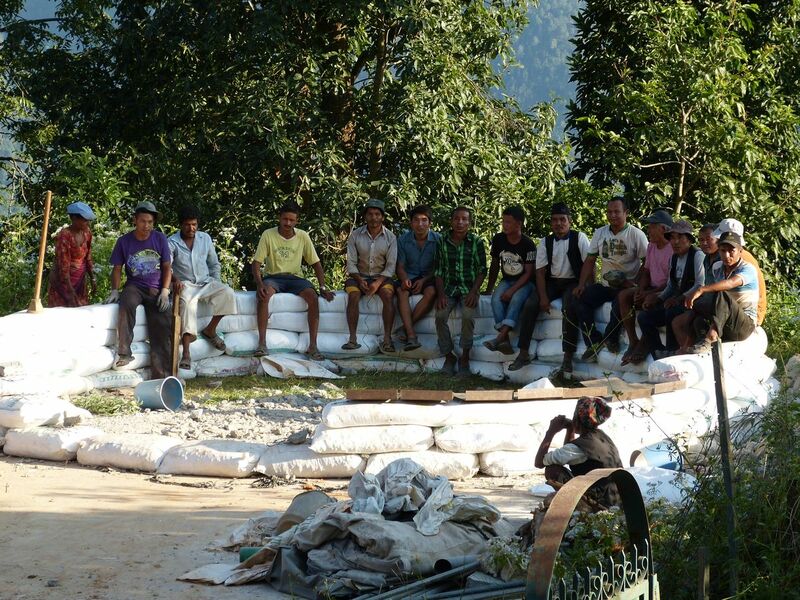 Gopal Tamang, our Nepal Project Coordinator (blue shirt) and ten builders from Darkha and Nuwakot eagerly learn about earthbag building technology. 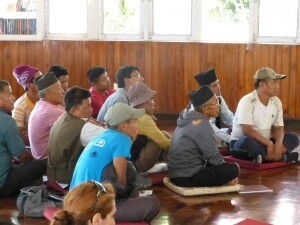 CNA hired a translator familiar with construction terms to translate the workshop lectures. 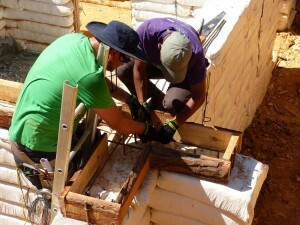 The first workshop was a seminar taught by Owen Geiger, the world’s foremost builder of earthbag buildings. CNA has long had an interest in this building technology, since it uses local soil and can be more cost effective than other building techniques. It’s also proven to be an extremely safe building technique for some earthquake-prone areas. In Nepal, we know of fifty-five earthbag structures that survived the twin earthquakes that struck in April and May 2015. The technique is durable and low cost, and may be a good fit for some communities we work with. Crucially, while it is labor intensive, it does not require labor from skilled builders, only training. 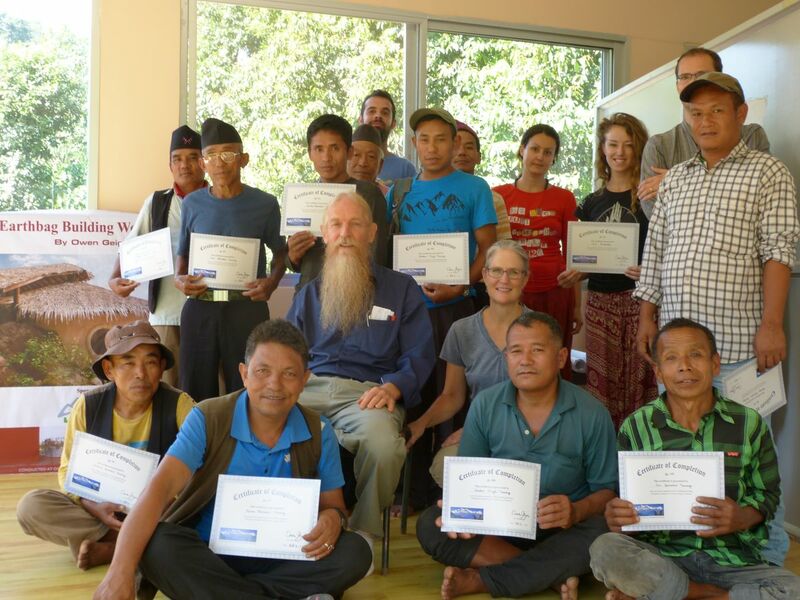 After a weekend break, everyone traveled to hands-on training provided by the New Zealand NGO First Steps Himalaya, in Sindhupalchowk district. The district was hit particularly hard during the earthquakes. According to figures compiled by the United Nations Office for the Coordination of Humanitarian Affairs, the district suffered the highest rate of casualties in the country, and at least 70,000 buildings were destroyed. [United Nations Office for the Coordination of Humanitarian Affairs. “Nepal: Official Figures for Casualties and Damage.” Humanitarian Data Exchange. Accessed December 7, 2015. https://data.hdx.rwlabs.org/dataset/official-figures-for-casualties-and-damage.] First Steps Himalaya constructed an earthbag building that was completed just one week before the first quake struck, and survived intact. We actually shared some of our meals inside the building! The training lasted four days, and we got to put the theory we’d learned into action. 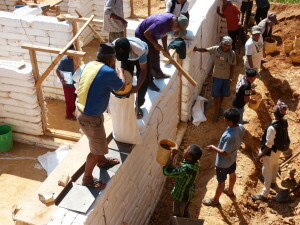 It was extremely hot and difficult work, but everyone seemed to enjoy learning a different way to build homes and schools. The entire crew jumped in, and helped the NGO build a group home while learning the finer points of building with earthbags. Darkha builders filling polypropylene bags with earth. A layer of barbed wire between the bags keeps the bags from sliding off of each other. Gopal learning the art of tying rebar from a New Zealand construction company. CNA-sponsored builders taking a break from a circular classroom they constructed themselves. Circular buildings go up very quickly and are the strongest building shape known to man.